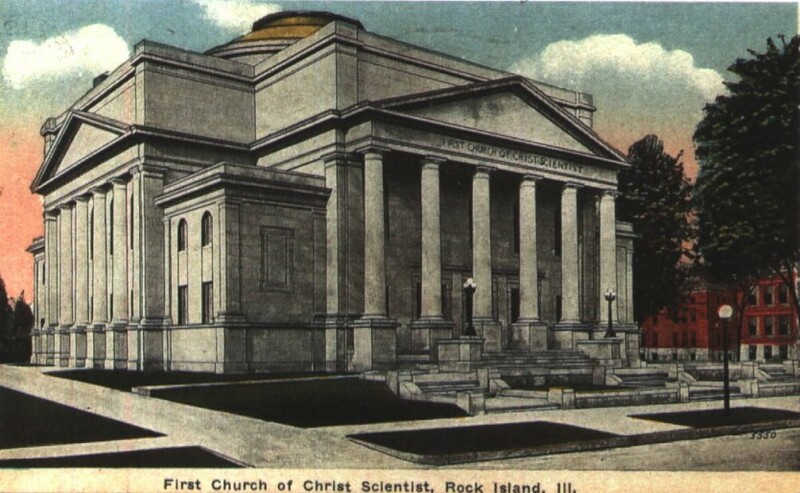 This postcard shows a building that doesn’t look like a typical church – no steeple, bell tower or figural stained glass windows – but it is characteristic of Christian Science churches throughout the world. The first Christian Science Church, the Mother Church, was built in Boston in 1894 and enlarged in 1906 with a large domed addition. That addition was the inspiration for the church design in other locations. The local congregation intended to hire famed Chicago architect Solomon S. Beman to design the new church. Beman, who was the architect for Mary Baker Eddy, the founder of the Christian Science denomination, had designed many Christian Science churches. Unfortunately Mr. Beman died only two weeks after being contacted by the Rock Island building committee. As a result, Chicago architect William C. Jones was retained. The Rock Island congregation was organized in 1896 and shortly thereafter built a small frame church building on 23rd Street. When the church on our postcard was occupied, the old church was demolished and its site was incorporated into the side yard of the landmark Frank P. Welch home at 817 23rd Street. Many prominent local residents, including the Denkmann and Mixter families, were active in the local church, and many lived in the nearby neighborhood, now the Broadway Historic District. By 1914, the congregation had grown enough that a new building became necessary. A location was selected on the southwest corner of 22nd Street and 7th Avenue. The large Cyrus Dart family home on the site was demolished for the church construction. The home’s lot had originally included the entire half-block of 22nd Street between 7th and 9th Avenues. Not until Mrs. Dart died at the turn of the century was the parcel was broken into residential size lots, which explains why the homes on the west side of 22nd Street are newer than those on the east side. Mr. Jones designed our postcard church to look less like the Mother Church and more like a 16th Century northern Italian summer house in Vicenza. Its Italian Renaissance style reflects the design of architect Andrea Palladio for the Villa Capra (also called the Rotonda). Villa Capra was a simple symmetrical hilltop home. It was square with entrance porches – porticoes — on each of its four sides, a room in each corner, and a circular hall lit by a central dome. Today we frequently use Palladio’s name when referring to Palladian windows. Such windows have a large round-top central window flanked by shorter square-topped windows. Like the Villa Capra, our Christian Science church is basically a square building with a pillared portico – in our example the portico is only on the front, although both sides have a triangular pediment and engaged (touching the building) columns which give the appearance of a portico. The Bedford (Indiana) stone church was completed in 1915. It cost $114,000, which included the large pipe organ and furnishings. The shallow hipped roof rises to a prominent central dome at its center, which can be seen from a surprising distance. The dome is encircled by small electric lights around the top. The central portion is glass to allow light into the sanctuary through an inner dome. This inner dome is made of several thousand fishscale-shaped pieces of stained glass. The six columns on the front are monolithic – meaning that each is a single piece of stone. Behind the columns, the entry doors have beveled glass in bronze frames. Their clear glass transoms have a stylized star motif, as do the opalescent – mottled white and amber – stained glass windows throughout. On the interior, four original 48-inch diameter opalescent glass chandeliers add more light to the sanctuary, which seats 840 in curved birch pews. The church is a designated Landmark and is also part of the National Register Broadway Historic District. In 1994, it was sold and the religious use ended. Since that time, it was mostly unused. Although some vacant churches end up being reused for religious purposes, it is more common to find what preservationists call an “adaptive reuse.” This simply means that a building serves a different function than originally intended, yet it keeps the important features of its historic architecture. In 2007, foreclosure action resulted in new ownership. However it was still vacant until 2012 when the Dr. David Karpeles family purchased it to become a Manuscript Museum. After significant work, the large lobby area was transformed into the exhibition space. While work on the sanctuary continued, a freak windstorm in April 2012 lifted the exterior glass dome like a Frisbee and it flew across the street, landing on a rooftop. Fortunately the interior stained glass dome was generally intact. Read more about that catastrophe at http://tiny.cc/f9nycw However the museum staff soon announced that the dome would be restored. This article by Diane Oestreich is slightly modified from the original, which appeared in the Rock Island Argus and Moline Dispatch on May 5, 2002.